Yesterday, I had a rather eventful time in the bookstore. 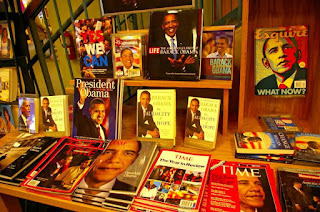 Firstly, a beautiful and perfect six year old girl had me singing for her, and then I walked to the center of the store; I had to take a picture of this table with books only about President Obama. It was Obama this, Obama that, Obama thingy everywhere! Good news, I left the bookstore with only two books. This is probably the first time in a long while that I had done that. Hurrah!! It dawned on me then to recommend a very easy, but powerful read. Trust me, it’s worth the read and you can get it, pre-owned, on Amazon for a few dollars. Khaled Hosseini’s The Kite Runner is worth the read. I literally read it front to back in just one night. The Kite Runner is Hosseini's first novel, and it bears an uncanny resemblance to his own life. The main character, Amir, grows up in Afghanistan and ends up fleeing to the U.S. during that country’s decades of violence. For a first published book, The Kite Runner is quite a powerful read, with literary hooks that just catch you and won't release. The Kite Runner is an example of "fiction" immersing readers into a world so real that it might be nonfiction. The characters are imaginary, but in a sense they are very real, telling the stories about a divided Afghanistan under Taliban rule. This is the story of two childhood friends: Amir, an upper-class Pashtun, and his conflicted friendship with Hassan, the son of his father’s Hazara servant. They share a beautiful friendship which is torn apart when a fearful act of betrayal marks their lives forever and sets in motion a long awaited quest for redemption. This book is centered on Amir’s guilt of his childhood treatment of Hassan, and his struggle to redeem himself from guilt. Since Afghanistan has been in the news a lot lately, you can learn a lot about its history, its culture, its religion and its wars. 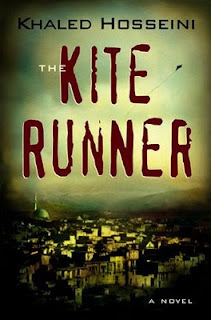 The Kite Runner is probably an excellent first book that will draw you into a world that is otherwise utterly foreign. And maybe reading it will help you to humanize your understanding of the Afghan people. I read quite a lot especially when I come across a good book and this one seems quite interesting. The ways you critique it make it sound quite interesting. I will surely look out for it at the stores. This book was incredibly touching. I recently watched the movie as well and was not at all disappointed. Excellent choice of recommendation!!! Linda, this is a great site!! Please keep us updated. Good job Linda,this is a great blog about Crooked Tree and Belize. I hope that you get lots of feed back from readers.